Data copied from an HTML table loaded on IE browser doesn't paste the data properly on handsontable using chrome/firefox. The data copied from IE has a different format. Every TD value is delimited by space not by tabs. Data only gets pasted on 1 cell. Can you record it? I am not sure If I'm doing it right. Thank you very much. I can see it now. We need to check the separators and change the way the data is pasted. It is not a bug of Handsontable. 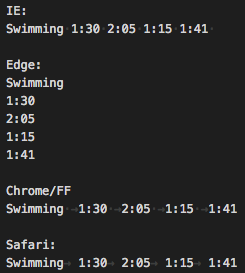 Browsers parse data to text/plain value in different ways (see below screenshot). In Handsontable, the pasted data has to be in text/plain type. Cells are separated by TAB (arrow) and rows by ENTER. I've noticed the fact that Excel parses the pasted data in the same way as Handsontable. So will this be tagged as limitation of handsontable? I tried to copy an HTML Table data from IE to excel and it parses it correctly. I’ve checked this one again, on the Excel for Windows and you were right. This works fine there. I made small investigation and we need to add support for text/html mime type. So, this issue is the improvement suggestion / change / feature request. Is this a limitation? Well, yes and no. Why? Because in IE you have an access only to window.clipboardData.getData('Text') and window.clipboardData.setData('Text', ...). That means you can read only text/plain values from the clipboard. Of course, in a modern browser, we have access to read/write values as text/html. But this is a new feature as I’ve mentioned above. Ok, but let’s go back to text/plain. In our SheetClip library we trying to parse plain text into an array of values. There is a rule that we looking for two defined whitespaces. \t is a column separator. \n is a row separator. Currently, we can read only text/plain. But inside the clipboard is no \t whitespace.